California’s Finest: Guac! | Delicious! Delicious! Under one of the large, white tents, enough tables are set up for a few hundred people. CATERERS are busy setting up for lunch. Caryn wanders around base camp, stretching her legs and looking around. She strolls up to the craft services table to investigate. A smorgasboard of snacks is spread out for all to partake. She grabs a little piece of chocolate. Are you Mr. R.’s assistant? Caryn turns around to be greeted by a prim, YOUNG WOMAN with a tight ponytail and stylish glasses. I’m Amelia. I’m the director’s assistant. Oh wow. That sounds like fun. Amelia picks up a tortilla chip and cracks it into two pieces. It’s okay. Your job sounds like more fun. How is it to work for him? He seems soooo cool. Amelia dips the chip particle into a bowl of brownish guacamole and eats it. Yeah, it’s okay, I guess. You’re so lucky. He’s even hotter in person than on screen. And he’s so charming. She stirs the water back into the guacamole and scoops another helping onto the other half of her chip. The CRAFT SERVICES MAN comes up and places another bowl of chips on the table. How do you like the guacamole? I just made it fresh. Caryn takes another glance at the gloppy mess. Amelia’s cell phone starts buzzing away at the clip on her belt. Oh! I gotta go. Caryn, come over to our trailer later. Some other assistants are gonna watch a movie. Caryn smiles and nods enthusiastically. Amelia grabs another chip on her way, but Caryn opts for an apple. A FedEx box with Caryn’s name on it leans against the trailer door. Caryn rips it open to find a box full of fresh California avocados. She peeks inside the box looking for an explanation and finds a brief note scrawled on paper. She flips over the note to discover a recipe in the same handwriting. extraneous. the simpler the better. also i personally hate tomatoes in guacamole. 1. peel & pit avocados. mash the pulp in a bowl. serve immediately with Frito’s(r) brand corn chips or cover & refrigerate. 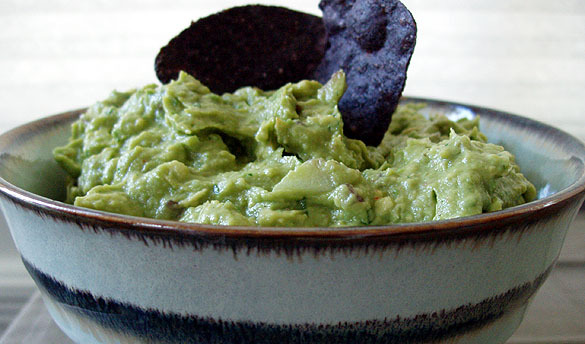 (mark bittman claims that including the avocado pits in the dip helps prevent the guacamole from turning brown if it is prepared up to 4 hours in advance. i don’t know if this is actually true, but it is definitely true that leaving it out for awhile will allow the guacamole to turn a really disgusting shade). p.s. just kidding about the fritos. I usually don’t opt for the cayenne pepper, but use a minced jalapeño instead. It adds to the freshness and goes well with the other ingredients. You have a great site with absolutely wonderful photography. I also find the narrative quite enjoyable. This guacamole is making my mouth water! Nice guac. I like to mix in a little of Trader Joe’s salsa verde for a bit of a bite, that lovely zing of vinegar and tomatillos. I too miss California, but I’m making the best of it here. The best chips I’ve tried are also made by Lays, they’re called Santitas. Very crisp, salty–but not too salty, and not greasy at all. mmm. I also really enjoy your unique style of blog entry. It’s refreshing. Feel free to visit mine for garden shots. Oo, I always like salsa verde, particularly tomatillos. I’ll have to try it in (or with) the guacamole. And thanks, Big Lu!. I find a narrative about barbecue in LA enjoyable too!